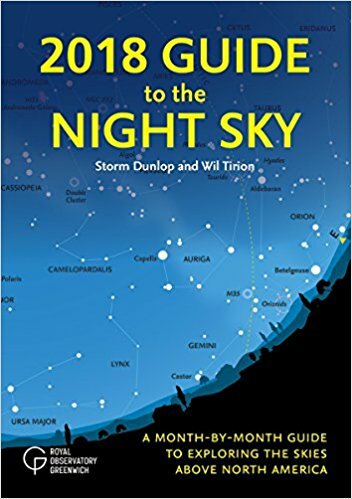 I recently picked up a copy of the 2018 Guide to the Night Sky for "homework" you might say. I've had a little bit of an interest in astronomy in the past few years, but not the time available to learn or do anything about it. However, lately, there's been an opportunity to learn and I've been exploring the night sky in very small bite-sized chunks. It's fascinating! I'm on the look out for good source materials for our family to use as we (um, struggle to) identify asterisms and constellations and planets among the billions and billions of confusing stars. Eye Spy has never been a more challenging game as far as I'm concerned! Yet, it's interesting work, to be sure. When you are looking up at the night sky you feel like you are a part of history past in a rather unique way which is hard to explain. It's overwhelming and mesmerizing all at once. One evening I found myself browsing good ol' Amazon looking for resources to further my education as an extremely wet behind the ears amateur astronomer and I ran across this book and decided to give it a go. Now, I am a novice so I guess I can't say if this book is top notch or if there is a better resource out there, but I do find this book rather useful and wanted to note it on the old book blog. In 2018 Guide to the Night Sky, author Storm Dunlop and star map maker Wil Tirion lay out a month-by-month guide for what you can expect to see over the course of this year. The Introduction to the book is useful in explaining some key terminology and then the majority of the book is divided up by month. In each section you are given a map of the sky from both a northern direction and a southern direction, from the 40 degree latitude vantage viewing point. The focal point makes this book impractical and un-useful for peoples living in the southern hemisphere but it is useful for much of North America and European nations within the same latitude. With a handy and helpful planisphere and this book guide it's been a little easier to figure out what direction I should be looking up at and I'm beginning to get a feel for which constellations are where in conjunction to one another. It's a slow start, but it is a start and it's a fun thing to figure out. Again, I couldn't say whether or not there is a better book guide to have on hand, but I like the fact that this title is specific to 2018 as it helps me to plot out specific events or positions as we will see them this year. I recommend it to beginners as I have found it useful. Of course, if you have a better suggestion to offer please leave a comment below and share your own resources and findings! Thanks for the recommendation! We've enjoyed H.A. Rey's "Find the Constellations". The recently republished version also has an updated list in the back that includes the locations of the planets. If you have a smart phone or tablet, I recommend downloading the app SkyMap. You calibrate it to your location, point it at the sky, and it (slightly) simplifies spotting constellations. It's not an exact solution, and doesn't take the fun or challenge out of it, because you still have to find patterns and locations, but it does give you the names of constellations, and stars, and show you the difference between planets and stars.